When the Rev. James Perkins heard the Meramec River was rising toward his church in December of 2015, he and some volunteers loaded the church’s communion table and piano into a trailer and got them to safety. They’d planned to come back for the drum set, but the river rose too quickly. Four months after the flood, Perkins showed me just how high the river rose: the upper edge of the newly installed drywall inside the Historic First Baptist Church in Pacific, Missouri, was at his eye level. The raised floor at the front of the church was still only plywood, and the whole space was cluttered with power-washed pews stacked on top of each other. Eastern Missouri had been soaked with about eight inches of rain over three days, and the Meramec River, a half-mile from Perkins’ church, set multiple new flood records. The crest in the town of Pacific was almost a foot higher than the previous record-setting flood in December of 1982. Yet some areas were hit much harder than others. 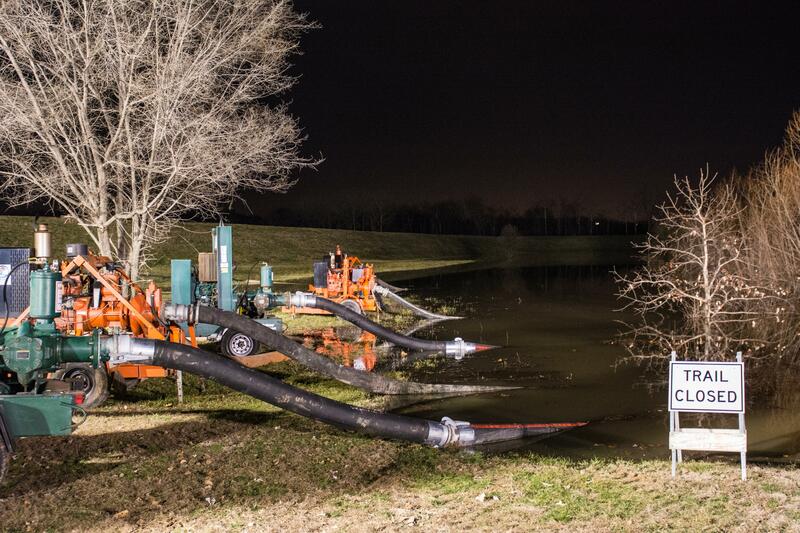 The new record 16 miles downstream at the St. Louis suburb Valley Park was over four feet higher than the 1982 flood. The higher record in more built up Valley Park isn’t just an anomaly, says geologist Robert Criss of Washington University in St. Louis. He thinks all the development in Valley Park since 1982 has constricted the Meramec so it can’t hold extra water from a heavy rain. Between a levee built in 2005 and a landfill gradually ascending on the opposite bank, the river doesn’t have any space to spread out, so it rises. River levels in the region are rising higher than ever, but not because there’s more water flowing. Analyzing historical river measurements from 66 stations along the Mississippi and Missouri rivers, Nicholas Pinter, a geologist at the University of California, Davis, and his colleagues found that 19 stations showed significant trends towards higher water levels. But 13 of those 19 measurement stations did not show complementary increases in the amount of water rushing down the river. Instead, Pinter and his colleagues found a correlation between rising water levels and engineering modifications to the Mississippi and the Missouri rivers over the last 100-150 years. As perplexing as it sounds, these earthen walls erected to protect people from floods can actually push the water higher. Since levees act as barriers to rising flood waters, they reduce the square footage a river can expand into. The water has to go somewhere, and since it can’t spread out anymore, it rises and rises. Levees do protect against small- and medium-sized floods, says Jonathan Remo, a river scientist at Southern Illinois University in Carbondale who worked on the historical study with Pinter. But although levees reduce the frequency of smaller floods, Remo says, in the long term they could worsen flood damage. “Levees are kind of a double-edged sword,” Remo says. After levees are built, people tend to move behind them. But then levees can fail. Water may seep under them, or gradually erode through them. When a river does rush over levees, the water moves with a lot more force than it would have if the river rose naturally, Remo says, scouring rather than flowing, and causing more damage. 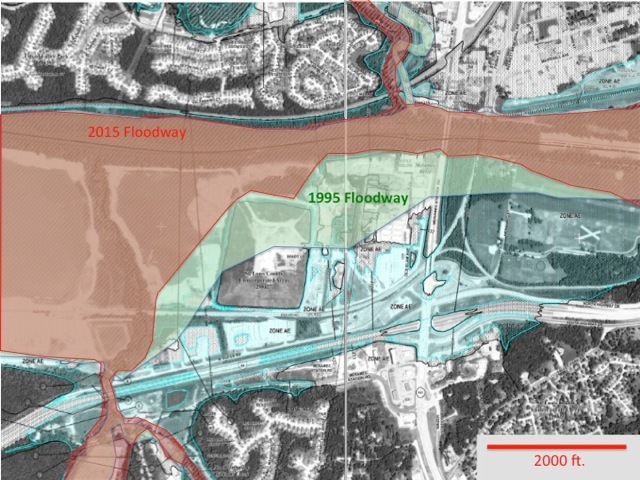 In recent years, the Federal Emergency Management Agency has tried to steer development away from the most flood-prone areas. FEMA holds out a carrot: discounted insurance for property in floodplains, but only where state and local authorities have adopted certain regulations to reduce potential flood damage. A proposed new building must not, for example, sit unprotected in an area FEMA has calculated to have a one-in-one-hundred chance of flooding every year. But communities can decide whether or not to take the proffered carrot, and if they do, municipalities can still issue permits for development in floodplains. In Valley Park, Criss says the landfill has grown significantly since the 1982 flood, though it sits half-inside an area designated as the Meramec River’s floodway in a 1995 FEMA map, an area that regulations say should have been kept clear of structures that would bump up the river level during a flood. Criss also points to new subdivisions on nearby creeks that flow into the Meramec, plus commercial development on filled-in floodplain, as exacerbating flooding in the area. Though FEMA provides the discounted flood insurance, and state emergency management agencies can assist communities that decide to participate, enforcing the regulations is ultimately a local issue. “It is the city that is responsible for administering its Floodplain Management Ordinance,” says Mike O’Connell, communications director for the Missouri Department of Public Safety. Criss’ assertion that the December 2015 flood was man-made makes sense to Mike Polizzi, mayor of the town of Fenton, directly downstream from Valley Park. The flood inundated Fenton’s parks along the Meramec, leaving the town with over a quarter-million dollars in insurance claims from the resulting damage. The river also swamped a sewage treatment plant, which had to shut down for a month and a half, during which time it dumped ten million gallons of raw sewage per day into a creek that feeds into the Meramec, according to Polizzi. With improvements in mapping technology, FEMA can better help communities understand their future flood risk, says O’Connell of the Missouri Department of Public Safety. But what communities do with that information will be up to them. Criss anticipates the region will continue on its current trajectory: more development in floodplains, more economic losses from flooding, with no acknowledgement that manmade structures are a big part of the problem. As for Rev. Perkins, volunteers are restoring his church little by little, sometimes by surprise. One day in April, after he and I heard the buzz of a lawnmower, he looked outside to see a church member mowing the grass around the building, unannounced. The last time the church flooded, in 2008, it took a year of work — much of it by one man who took no payment — before the congregation could come back. This time, the damage is worse, and Perkins doesn’t know when the church will be fully repaired. The man who helped so much last time now has heart trouble.